Now they’re up in Maine, homesteading. What?! Richard and Maria on top of their new world, happy in their fields of wild blueberries. Visible below are their home and barn, and far back, Lake St. George. She picked the flowers on the walk up. By John Guy Laplante With 9 photos. By the way, he knew hardly any Polish. She knew some basic English–she studied it in school, but only because she had to. She also speaks German. Richard has been an architect for over 30 years, with a varied and interesting practice. Maria was, as she puts it, a “paper pusher” for 25 years. I think she was being modest. I have met her. I believe that her “paper pushing” was sophisticated and complex. They both had a yearning to simplify their lives and to become self-sufficient as much as possible. 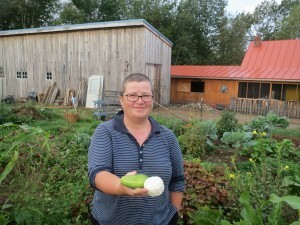 They had joined the Maine Farmland Trust, an organization that specializes in connecting farmers looking for farms with farms that are for sale. Following up on a lead, they turned onto a thinly populated road in the back country here. They came upon a long-unused farm. Not exactly a farm. The place had only an old cabin–a hunting cabin. An open floor plan finished in knotty pine. A kitchen and bathroom (including a septic system), but no running water. Only a wood stove for heating and a small gas stove for cooking. It did have electricity. There wasn’t even a real driveway. Just a field road winding six hundred feet up to the cabin. They love their goats and their goats love them. It’s that simple. Don’t they look radiantly happy? But rising high behind the cabin was a hill that was a big field. 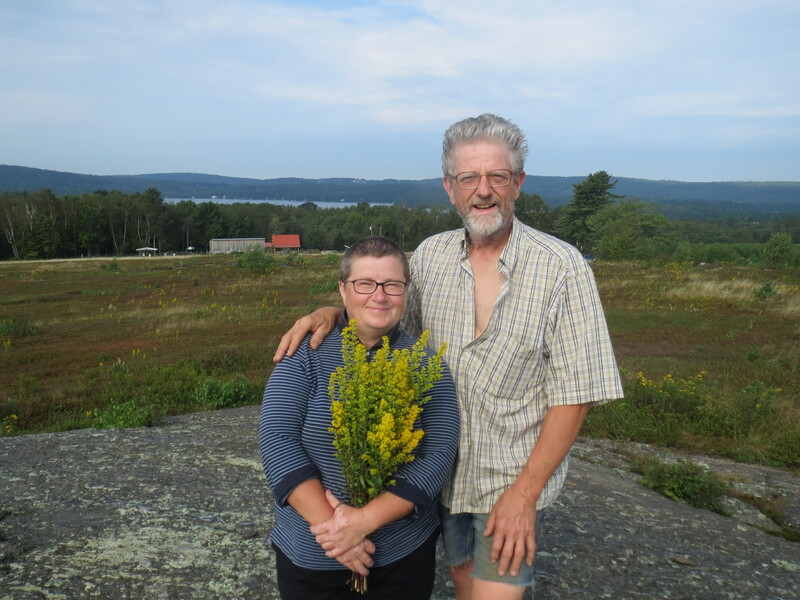 On that day, windy and overcast, they saw the whole field covered with native blueberry plants. They got excited by the wild character of the land and its rough rock outcroppings. They strolled to the top of that hill. Down on one side, less than a mile away, they could see the clear blue water of Lake St. George. It’s a big lake, and is the home of a state park. Beautiful. And off to another side they saw several nearby mountains and a very large one in the distance. It’s only later that they found out it was the famous Cadillac Mountain in Acadia National Park, up by Bar Harbor–fifty- four miles away. They were thrilled. This was the place! A gift for me for the road—fresh-picked cucumbers and fresh-made cheese. That’s the house, attached barn, and separate barn. All part of a plan. them. Their homesteading is far from over. They plan to do much more. But what an impressive start! The first months were not easy. Said Maria, “Being here in winter without water. Can you imagine? They work seven days a week, 8-9 hours a day, with hammer and saw, pick and shovel, scythe, and backhoe, or whatever. They are true partners. Maria works as hard as he does, and at the real physical jobs, too. Here are some down-to-earth details. The blueberries. It is not their cash crop (yet, there is a local blueberry cooperative interested in next year’s harvest), but they pick enough to freeze them for use through the winter. The remaining berries stay in the field feeding the coyotes, Canada geese, turkeys, maybe also moose (they have seen one recently in the field), and, oh yes, their goats! The goats. Visiting their new property in the fall of 2010, they attended the regionally famous Common Ground Country Fair in Unity, Maine. Lots of livestock to look at. They became interested in the goats. 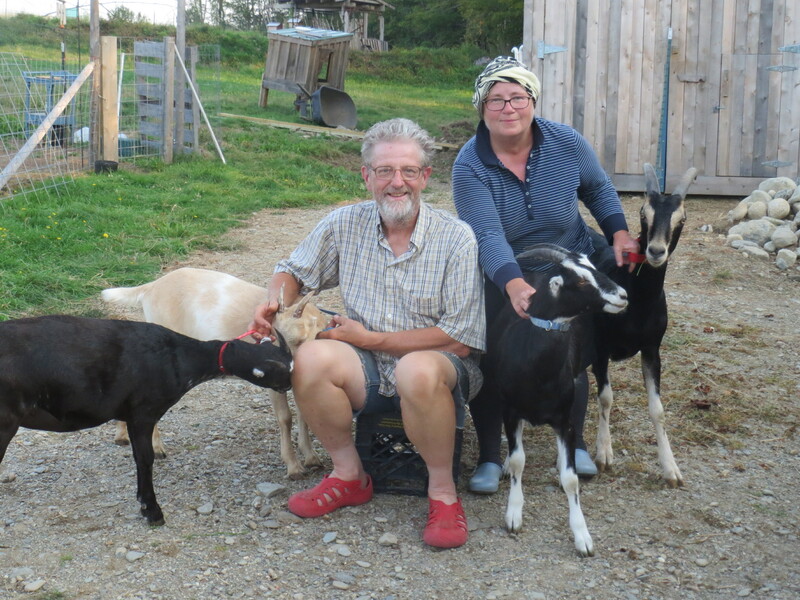 They decided to get dairy goats to have their own milk and to make raw-milk cheese. They heard of a goat farmer in Connecticut who taught goat husbandry. They signed up. Worked with him for ten weeks, five mornings a week. 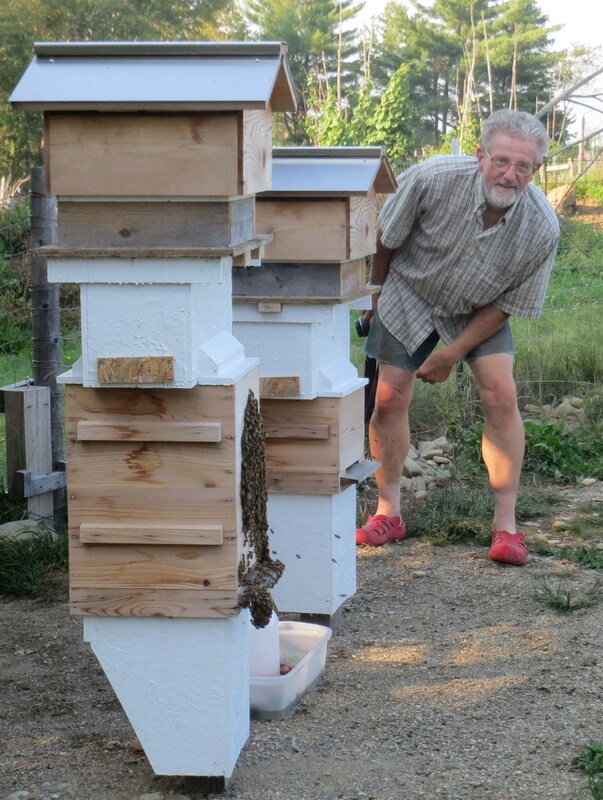 These hives house their thousands of bees–their essential partners. Maria makes a special herb tea for them. Learned as much as they could about goats. When and how to feed them and water them. How to milk them. How to de-horn them when necessary. What diseases they’re prone to. On and on. 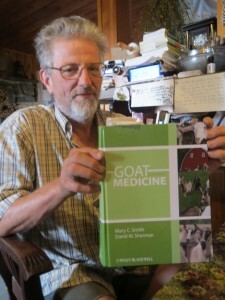 Upon “graduation,” the farmer gave them $400 apiece for their labor, four baby goats and two bales of hay. It was June 2011. The moment of the new start. They put the goats and the hay in the back of their Honda Fit and took them up to Maine. That was the beginning of their herd. They now have eight, one buck, two wethers (castrated bucks) and five does. One goat really caught their heartstrings. Asher. In one word, a darling. But only nine months old, he became gravely ill. They took him to a veterinarian. He said it was hopeless and they watched as the doctor gave him a fatal injection. As they told me about it, I could tell what a traumatic experience that was for them. As they spoke, I got the feeling the goats were part of their family. That’s really how they felt about them. In the yard, we watched as the goats munched grass and moved around freely. They never go far off. Richard said that soon they will breed two of the gals. Caleb, the buck, will be the sire. It was milking time. “Come and watch,” Richard told me. I followed the two of them into the attached barn. Richard had designed and built a milking stand. He placed some goodies into a pan at the front and brought in a goat, which hopped onto the stand. Her name was Lilith. She was so happy. Maria tenderly Lilith’s teats and began milking her. It took only five or six minutes. Now about their construction and fix-up projects. It’s milking twice a day, seven days a week. And no holidays. They use the milk straight. No pasteurization. They’ve made big improvements to the cabin. They’ve done a lot of finish work. Drilled a deep well, which was all-important. They now have a bathroom with even a big, big tub (a cattle watering tank actually). They heat with their woodstove but have constant gas hot water. And a small kitchen. Comfortable furniture. In one corner is Richard’s office complete with computer and Wi-Fi. Maria has her own computer. Many bookshelves loaded with books, and what a variety. They had me sit down with them for dinner. I’m a vegetarian, so they made it vegetarian. Nice people. I suspect they may becoming vegetarians too. A very tasty dish – pasta with stinging nettle. Maria separated the leaves from the stems with bare hands! She did not mind the stinging, after boiling the plant looses the sting. Fresh-from- the-garden tomatoes with basil and Maria’s goat cheese, which I found tasty and surprisingly chewy. Red wine. Plus lots of good talk. The taste and the texture of that cheese Maria brought from Poland in her memory. Similar cheeses are made in the Polish Tatra (part of the Carpathian mountain range). Astonishingly enough the cheese is formed by hand and molded in Maria’s own crocheting! They’ve also done a lot of building. Added a long, enclosed porch along one side of the house. Added an attached barn for the female goats. It’s accessed through the porch, which makes it easy when it rains and in the winter. Built a separate and bigger barn with a hayloft a few feet away. They keep the goat guys there—important to keep them apart from the does. And a couple of small outbuildings. At the grave of their favorite goat, Asher. He died very young. Maria made the plaque with his name. As the three of us walked through it, Maria spotted a big fat caterpillar crawling through the grass. Pointed it out for me. “Don’t step on it, John!” I didn’t intend to. I noticed a big, shiny blue tractor parked off to one side. With a front loader and a backhoe. Obviously a major purchase. Maria nodded and chuckled. “That was Richard’s dream! And his dream has come true here!” But it also was needed for digging holes in the ground and long tranches for pipes and foundation, for moving stones and small buildings, for establishing the driveway! The studying never ends. Then they put it into practice very satisfying. Richard does all the errands in one or two trips a week. Maria stays at home. She smiles. “I like it here!” She goes days without leaving the place. In the morning, after I interviewed them a little, Richard said to me, “Let’s take a walk to the top of the hill.” Off we went. Up at the top, we had a clear view all around. The sun was high and it was all very beautiful. I could see Lake St. George. A very nice sight. Maria pointed East toward Cadillac Mountain, but it was too hazy to see it. Turning around, we looked down on their homestead. Their house–well, it’s no longer just a rude hunting cabin. It’s a real home. Saw the two barns. Even the big blue tractor. And so many other things they have done. Very impressive for just two years. All the result of very hard work and real determination and passion. One huge achievement, to me for sure, is how well Maria speaks English. Amazing. And the variety of her interests. I see this quite often. She emails me a comment about one or another of my blogs. She’s a lady of few words, but her comments are always interesting. Walking back down, we passed close to a big boulder. Maria led us right up to it. Attached to one side of it was a small sign with one word. “Asher.” I knew that was the name of their first goat. And what happened to him. 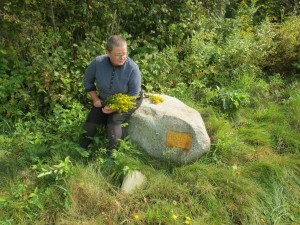 They had chosen the boulder and Richard had used his tractor to place it on Asher’s grave. The dinner that they invited me to share with them. They both cook. I enjoyed every bite. Back down, I said goodbye, hopped into my van, and started slowly down the rough driveway. In my mirror I could see they were watching me go. I stuck my hand out the window and gave them a little wave, and they waved back. On my way through tiny and quiet Liberty and onto the highway, I was very deep in thought. I had been in on Richard’s bold dream from the very start. I watched it unfold one bit at a time, but then, far from where it was taking place up north. And I wondered time and again, is this just another mid-life crisis, one that may have an unhappy ending? Now, from what I had just seen, I didn’t think that. So again, dear friends, I ask you, is it possible for two people of strikingly different backgrounds and in late middle age to begin a challenging new life in a new part of the country and find fulfillment? What do you think? Well, up here in rural back-road Maine, it certainly seems so for Richard and Maria. They have their own website (www.goatspiritfarm.com), which Maria maintains. I just looked at it. They had not mentioned it. I found out when I got home and received an email from them. It’s amazing, like so many of the things they’ve been doing. Wonderful text, photos, and design. Its name…goatspirit farm! I suggest you take a look. What a lovely piece! 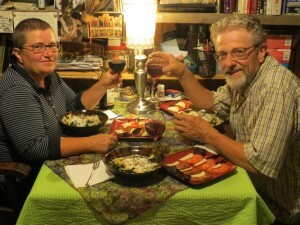 Maria has been teaching me conversational Polish over the web for several years now. We started before she even met Richard and – increasingly agog – I’ve followed this remarkable story from my terraced home in suburban North London (UK). Rather different flora and fauna here. I know how hard they’ve worked and remember hearing all about Asher and the bees and the other goats. Great to see they’re getting some recognition. Maybe one day I’ll taste some of that cheese – I’ve never actually met either of them. Maria – I’ll be back in touch when things settle down. The beginning of the academic year has been a bit hectic. Best, Nick. We here go after seasons, prolonging them if the weather plays with as it is the case right now. You might like the cheese of Polish provenance, however we create here also a cake from ricotta cheese that is an aftermath of the regular cheese production. John hadn’t had a chance to taste it (as Richard was away directly before John came) but I may assure you it is incredibly mouth watering. Just take a break from holidays in France and pay us the visit in Maine, the vacation land: Maine – The Way Life Should Be. This lets me ask a question: why, not being a fisher woman, I am not able to get a trout on my plate – here in Maine? I can get lobster but not a single trout! I’m a die-hard romantic who can’t help but envy this couple and dream – :->)! Whereas you meet such interesting folks on this journey, remember you leave them with a memory of a man called John, who took the time to get to know them and another way of life. Good for them and you! You carry on and I’ll continue to dream. And for that cheese – I’d like some, too. I have a few unprintable words….